This week Microsoft updated its support statement for Visual Basic 6.0 to include the upcoming Windows 7. Even though the original idea was to not support VB6 in Windows 7, given the outstanding demand, the runtime WILL BE included in the OS. 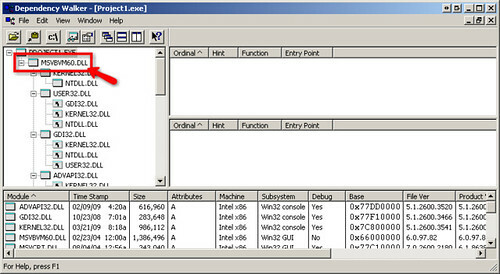 Visual Basic 6.0 IDE: Unsupported as of April 8, 2008. Visual Basic 6.0 Runtime: Supported for the lifetime of Windows Vista, Server 2008 and 7. *This is the big change in the Support Statement*. Visual Basic 6.0 Runtime Extended Files: The supported versions are here. Even though the runtime components will be supported in Windows 7, it is important to consider the implications of the IDE not being supported (as I described in this post). There are also additional advantages of moving to .NET such as 64-bit support (VB6 apps are 32-bit only) and all the productivity, maintainability and deployment gains provided by the platform. The Visual Basic Upgrade Companion is able to generate both C# and Visual Basic .NET code from the original Visual Basic 6.0 code base. Thus, when doing a migration project with our tools, you can choose either language. This decision is a challenge itself, especially if you aren't doing any .NET development before the migration. You have to measure the skill set of your staff, and how comfortable they will feel with the transition from VB6 to either language. Support: Both languages are well supported by Microsoft, and are first-class citizens on the .NET Framework. Neither one will go the way of the Dodo (or the way of J#, for that matter). Adoption: C# seems to have higher adoption than VB.NET. A completely unscientific and in no way statistically valid quick search on the books section of Amazon, however, returned 15,429 results for C#, and 2,267 results for Visual Basic .NET. Most of our customers migrate to C# instead of VB.NET as well. So there may be some truth in this. Perception: C# was developed from the ground up for the .NET Framework. This has affected VB.NET's mind share, as C# is viewed as the new, cool language in town. C# is also seen as an evolution of C and C++, which are considered more powerful languages. And we've all heard at least one Visual Basic 6.0 joke - which means that even though VB.NET is a completely different beast, the "VB" name may work against it. Familiarity: Visual Basic .NET's syntax is very similar to VB6's, so it is assumed that VB6 developers will feel right at home. This may or may not be true, since they will need to learn all the differences of the new environment, not only the syntax. Cost: It also looks like people with skills in C#, on average, earn more than those with skills in VB.NET. This is also something to keep in mind when deciding which language to choose. .NET allows you to mix programming languages, even on the same Solution. So you could have some developers work in C#, while other work in VB.NET - basically let them use the language they feel more comfortable with. DON'T. This may become a maintenance nightmare in the future. You should definitely standardize on just one language, either C# or VB.NET, and stick with it. That way you'll save time and resources, and overall have a more flexible team. Also, keep in mind that the biggest learning curve when coming from the VB6 world won't be the object orientation of VB.NET or the curly bracket syntax of C#. It will be learning the .NET Framework. That is what you should plan training for, not for a particular language. Learning the syntax for a new programming language is pretty trivial compared to the effort required to correctly use all the APIs in .NET. All in all, you can do anything on either language. I personally like C# better, mainly because I started with C, C++ and Java before moving on to .NET development. Coding is C# is "natural" for me. But you can develop any type of application in C# or VB.NET, as there's no meaningful difference under the covers. Binary Compatible .NET DLLs: This technique allows you to expose .NET components through COM. It is recommended for multi-tier apps, especially if you want to migrate the back end before you migrate the front end. It allows VB6 and ASP applications to continue using the same components even after they are migrated to the .NET Framework. Once you have the .NET code, you need to check Register for COM Interop in the Project Properties page in Visual Studio.NET, and then you are all set. Your VB6 and ASP applications will continue working with the newly migrated .NET components, transparently, while they await their turn for a migration. You can read more about this feature on the COM class exposure page. We recently did some quick tests on the results of some projects that we just finished migrating to compare the binary size and memory footprint of the resulting migrated .NET application and the original Visual Basic 6.0 application. Here is a brief summary of the results. We have seen that binary sizes remain very similar or decrease by a small margin when compared to the original Visual Basic 6.0 binaries. There is a small amount of application re-factoring that contributes to this reduction, though, such as consolidating all shared files to a common library (instead of including the same files in several VB6 projects, which increases the code base and binary size). You do have to take into account the space required by the .NET Framework itself, that varies from 280MB to 610MB. Our observations on the memory footprint of migrated .NET applications, when compared to the original VB6 applications, is consistent to what we've seen with the binaries' size. .NET applications have higher initial memory consumption, since the .NET Framework sets up the stack and heap space at startup, and you have to add the memory required by the JIT compiler. Even with these constraints, a quick revision of applications that we've migrated for customers shows that the memory consumption is, on average, around 10% less than in VB6 (these are no scientific measurements, just based on monitoring memory consumption during the execution of test cases). We have also seen that .NET normally maintains a more consistent memory usage pattern, while VB6 applications has more peaks where the memory consumption goes up, then back down. This is caused by the .NET Framework holding on to resources until the Garbage Collector runs, and the overall improvements in memory management included in the .NET Framework. .NET applications have a memory overhead associated with the .NET Framework itself. This is more noticeable in small applications, but overall, is a tradeoff required for running on a managed environment. According to the .NET System Requirements, the Framework requires at least 96MB (256MB recommended) of RAM to run. In our experience, however, you should have at least 512MB (1GB recommended) of RAM to run migrated applications comfortably (on Windows XP). The performance of a migrated .NET application, when compared to the original VB6 application, is normally very similar or better. The only instances when we have seen a performance decrease is when doing an important re-architecture or when the database engine is changed (from Access to Oracle, for example). Every once in a while we also run into issues with the Garbage Collector, but fortunately they are not that common and are easy to detect. One thing to keep in mind is the way .NET loads assemblies, and how they are executed. .NET assemblies are compiled to an intermediate language, called CIL (Common Intermediate Language, formerly MSIL). When these assemblies are executed, the default behavior for the .NET Framework is to use a Just-In-Time compiler, which compiles the CIL code for a method to native code "on the fly" the first time the method is called. This implies an overhead on this first call, which suffers from a (normally acceptable) performance impact while the JIT compiler runs. Once a method is compiled, though, it is kept in memory, so the performance of subsequent calls is not affected. Once the code is in memory the performance of the .NET application is normally better than the performance of the VB6 application. You can find more information on JIT here. It is worth mentioning that you can run ngen.exe on the application to compile the CIL assemblies to native code. This may improve application startup and first run times. Here's an interesting take on whether to ngen or not to ngen. Check out this performance optimization book in MSDN, called Improving .NET Application Performance and Scalability. It is slightly outdated, but the concepts still apply and are useful to improve the performance of migrated applications. Today we published a new White Paper, Planning a Successful VB to .NET Migration: 8 Proven Tips. In it, we share some tips on things that you should be aware of when migrating your applications. This is the first in a series of White Papers we will be releasing in the next months. The idea is to share the knowledge we have accumulated over the years performing Visual Basic 6.0 migrations to the .NET Framework. We have been involved with Microsoft in this type of engagements since the very beginning of the platform, and faced lots of issues in the process. This has shaped our current methodology, which, even though is still improving, has proven itself with solid results (a you can read in the recently released case studies). Hopefully you will find them very useful when faced with a migration task at your organization. So, What's New in the Visual Basic Upgrade Companion version 2.2? The Visual Basic Upgrade Companion enables the user to define customized transformations for the upgrade process execution. This technique allows to implement coverage for non-supported legacy components and to enhance and fine-tune the existing support. I already covered Custom Maps on this post and you can read more about this on the Custom Maps page. The Visual Basic Upgrade Companion converts the data access model on your VB6 application (ADO, DAO, RDO) to ADO.NET, using the either SQLClient data provider or the classes defined in the System.Data.Common namespace. Using the latter will allow your migrated application to connect with most major .NET database providers. Version 2.2 added support for the automated migration of DAO and RDO to ADO.NET, and greatly improved the migration of ADO to ADO.NET. More information here. This feature lets the end-user migrate his Visual Basic 6 code to VB.NET or C# with standard Naming Conventions. This feature is a compound of common naming conventions for .NET languages, and use standard coding practices for C# and VB.NET. You can find more information on this and the next feature in this page. Keywords: The VBUC must rename the names that are the same as keywords from Visual Basic .NET and C#. Moreover, the VBUC should take into account the target language (Visual Basic.NET or C#) to recognize the keywords that apply for each case. Case sensitive issues (C#): Visual Basic 6 is a case insensitive language, but C# is not. The VBUC must correct the name references used with different cases to the case used in the declaration. Scope conflict: This is necessary when a Type declaration element has the same name as the type declaration. If this case is detected the element declaration must be renamed along with the references to this type element. Conflicts with .NET classes: This section applies for Forms and UserControls, mainly, because they could declare some member names that are part of the corresponding class in .NET (in this case System.Windows.Forms.Form & System.Windows.Forms.UserControl). These members must be renamed in order to avoid any conflict. In Visual Basic 6.0 user controls expose their programmer-defined properties in the property list on the designer window. These user properties can be configured to be displayed in a specific category and based on these settings. The Visual Basic Upgrade Companion can determine the most appropriate type and settings for the resulting properties to have functional equivalence with the original VB6 user property. I plan on elaborating on this feature in a future blog post. Visual Basic Upgrade Companion version 2.2 released!! Custom Maps: You can now define custom transformations for libraries that have somewhat similar interfaces. This should significantly speed up your migration projects if you are using third party controls that have a native .NET version or if you are already developing in .NET and wish to map methods from your VB6 code to your .NET code. Legacy VB6 Data Access Models: for version 2.2 we now support the transformation of ADO, RDO and DAO to ADO.NET. This data access migration is implemented using the classes and interfaces from the System.Data.Common namespace, so you should be able to connect to any database using any ADO.NET data provider. Support for additional third party libraries: We have enhanced the support for third party libraries, for which we both extended the coverage of the libraries we already supported and added additional libraries. The complete list can be found here. Plus hundreds of bug fixes and code generation improvements based on the feedback from our clients and partners! You can get more information on the tool on the Visual Basic Upgrade Companion web page. You can also read about our migration services, which have helped many companies to successfully take advantage of their current investments in VB6 by moving their applications to the .NET Framework in record time! A few days ago we posted some new case studies to our site. 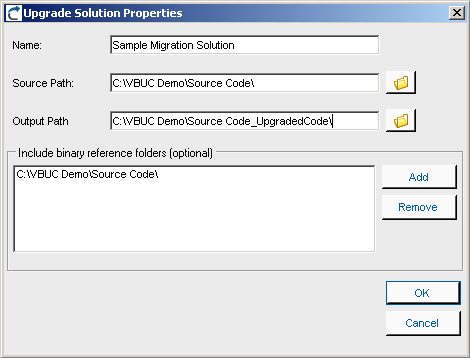 These case studies highlight the positive impression that the capabilities of the Visual Basic Upgrade Companion leave on our customers when we do Visual Basic 6.0 to C# migrations. The first couple of them deal with a UK company called Vertex. We did two migration projects with them, one for a web-based application, and another one for a desktop application. Vertex had a very clear idea of how they wanted the migrated code to look like. We added custom rules to the VBUC in order to meet their highly technical requirements, so the VBUC would do most of the work and speed up the process. Click on the links to read the case studies for their Omiga application or for the Supervisor application. The other one deals with a Texas-based company called HSI. By going with us they managed to move all their Visual Basic 6.0 code (including their data access and charting components) to native .NET code. They estimate that by using the Visual Basic Upgrade companion they saved about a year in development time and a lot of money. You can read the case study here.